Time just seems to fly by. I can’t believe we’re at June already! It seemed like just yesterday the snow was melting and I was chomping at the bit for warm weather, green leaves, birds and moths. Well, they’re all here, and they seem to have snuck up on me quite unexpectedly. They say this begins to happen as you get older, but I would hardly qualify myself as such just yet – and if time flies this much at this age, I can’t imagine how it’ll be zooming in another few decades. They also say time flies when you’re having fun, so I suppose that indicates how I’ve been feeling about life lately. I find myself whistling to myself while doing chores a lot more now than I ever did in the last couple years. Speaking of time flying… I was at my parents’ earlier this week; I had a dentist appointment that I had been putting off for some time, and then opted to spend some time in the countryside before I returned to the city. It was a gorgeous, sunny afternoon when I arrived, and I grabbed my camera and headed out to wander about the property for a bit and enjoy it all. In my wandering I spotted the Horse Chestnut above. 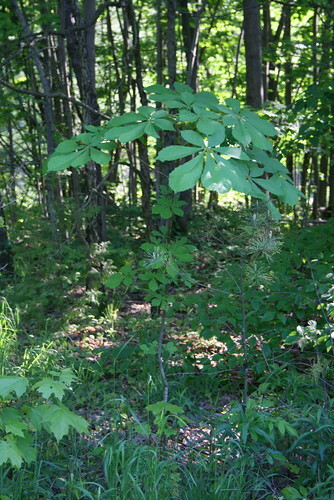 My sisters and I planted this tree as a chestnut when I was quite young. I can’t recall exactly how old now, but probably no more than ten or twelve. At the time, my parents took us to music lessons that were held in the basement of a small church. Just outside the church were a couple of beautiful, mature chestnut trees. The three of us loved to stop and browse through the fallen chestnuts, looking for ones whose cases were whole and unblemished, trying to find the perfect, smooth chestnut. We’d usually come home with pockets full of them. I don’t remember what became of most of them – they were likely either used in games we made up, or were lost. But during that period a couple got planted. This tree is exactly the same age as the first one. We didn’t have any idea of ideal conditions to grow a chestnut tree. In fact, we probably weren’t thinking of the long-term at all, but just planted them as a bit of fun. 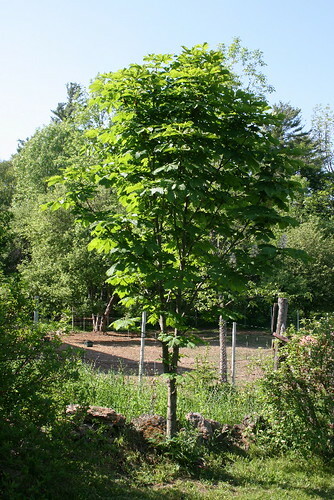 The first tree grows in an open patch that gets sun through most of the day, the second is in a well-shaded area at the edge of a stand of trees. I don’t know what the rationale behind choosing these two spots was, although the latter was along a path my dad kept mown at the time that we used to play along. While the first tree grew and flourished in the bright sunlight of its open location, the second remained rather stunted, growing to about a foot high and then seeming to remain at that size for years. It had trouble with rabbits, too, and for a while we had to put a wire cage around it to protect it. I’m not sure what changed; no trees or branches have fallen to open up the sky any more for it. However, it slowly began to grow again. This week as I arrived for some reason I paused and looked at the tree, growing a short distance from the driveway as it was. And I was somewhat amazed to note that it was now about as tall as I was, with a good canopy of leaves on it. How long had I not been paying attention to it? In my memory it’s still a little sapling two feet high. Both trees are now somewhere between fifteen and twenty years old. The second has a long way yet to reach maturity. But on the first tree, as I was standing there pondering how quickly life slips by while you’re busy living it, I happened to notice a few white racemes of flowers on a couple of its lower branches. And I thought, what a lovely metaphor for my own stage of life – the two of us, the tree and I, both poised on the edge of maturity. I consider myself a very mature person, but with 30 in sight I feel like I’m reaching maturity – that age at which all those things that one associates with being a “grown-up” actually happen, when people settle into careers, families, homes, and life begins to feel more stable, less uncertain. 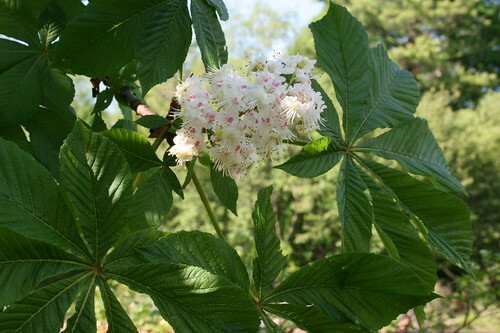 These are the first flowers the chestnut has produced. I counted seven racemes, nearly all on the lowest, oldest branches. 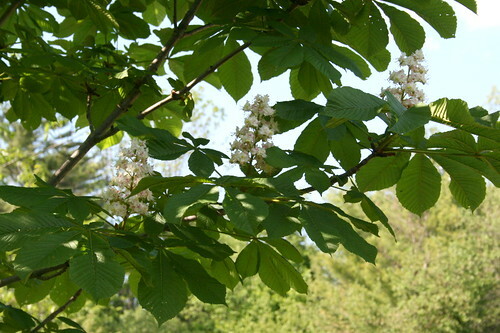 The Horse Chestnut isn’t a true chestnut at all (which are in the genus Castanea, members of the Beech family), but a member of the genus Aesculus, which also includes the buckeyes of North America. 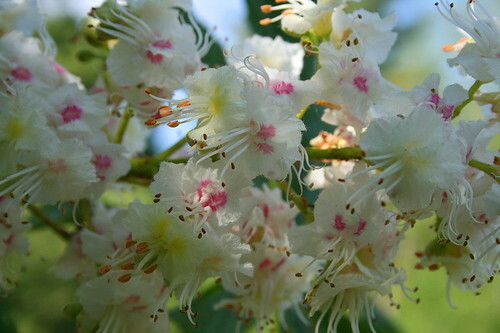 It’s sometimes written horse-chestnut or horsechestnut to avoid confusion with the other group, and to simplify common names of the different species. It’s not native to North America, but is commonly grown as an ornamental, and has since escaped into the wild. You can see why it appeals – the lovely white flower spikes, hinted with pink, are eyecatching in the spring. And what about chestnuts roasting on an open fire? I will admit never to have tried this, however; also, the nuts are slightly poisonous raw, and I presume this is the reason for the roasting. Children, especially those from the UK, play games with the large seeds – in fact, in some places the tree is known as the Conker Tree, after the children’s game of securing a string to the chestnut and taking turns trying to smash someone else’s with your own (the winning chestnut being the one that doesn’t break). I never played this game, either, though Blackburnian did as a kid. The seeds were also used by militaries in the two World Wars to create acetone, which was then used in the production of armaments. Historically they were also used for whitening and cleaning natural-fibre fabrics, as they’d produce a soap-like liquid when ground and mixed in water. Horse Chestnuts are one of my favourite trees, undoubtedly in part for the memories I have of them from my childhood, but also for their interesting leaves, flowers and seeds. I hope someday, when I’m well into my mature years and settled into a home of my own, that I might have a mature Horse Chestnut to shade my home and accompany me through middle age. What a lovely tribute to the Horse Chestnut. I too remember these trees from youth. A magestic pair once stood on the lawn of a house I passed daily on my walk to school. They’re long gone now, replaced by a strip mall. The tree that provided the chestnuts that produced the trees illustrated is long gone too, cut down, I know not why. I suspect horse chestnuts are generally in decline. They are not likely to appeal to suburbanites, being slow growing and a bit large for a small lot. Additionally, they are “messy” trees, somthing to be avoided on your golf-green lawn, and for those knowledgeable enough to be aware of it, don’t qualify for the movement to fill the urban forest with native trees. The native chestnut was, like the elm, victim to an imported blight This story is recorded in The American Chestnut: The Life, Death, and Rebirth of a Perfect Tree by Susan Freinkel. Today, many of the chestnuts available in supermarkets are “castagne” or “marroni” varieties imported from Italy. Thanks, Horsin’around. That’s sad to hear about the “parent” trees. I had no idea the species was under threat, but it does actually seem to be as devastating as the Dutch Elm disease of a few decades ago. Another common plant that turns out to be non-native! I’ve always liked them, too. Terrific account – your nostalgia invoked mine, and I remember so many times in my own childhood looking for those buckeyes, as we called them. They were thought to bring good luck if you carried them in your pocket – better than rabbit’s feet or 4-leaf-clovers!